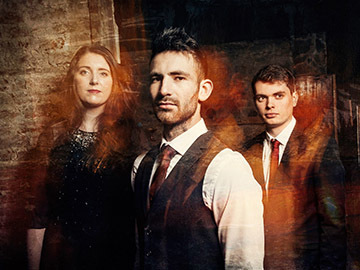 Winners of the 2015 BBC Radio 2 Young Folk Award, Talisk are one of the fastest rising bands on the British folk scene. Mohsen Amini (concertina), Hayley Keenan (fiddle) and Craig Irving (guitar) create a captivating, energetic and dynamic sound that, in little more than a year, has earned them multiple award wins and nationwide media and audience attention, as well as a nomination for Up and Coming Artist of the Year at the 2015 MG Alba Scots Trad Music Awards. Most recently, Amini was crowned the 2016 BBC Radio Scotland Young Traditional Musician of the Year, adding to their collective trophy cabinet that far belies their years. So too does their performance history, though – with appearances at world-leading festivals including the Cambridge Folk Festival, Fairport’s Cropredy Convention and Celtic Connections, as well as live sessions on both BBC Radio 2 and BBC Radio Scotland’s flagship folk programmes, theirs is a star firmly, and rapidly, on the ascent. Talisk updated their cover photo. Looking forward to getting back out on the road to see you all again! !